The only native pigeon to North America is the Band-tailed Pigeon. They are not a problem. The common city pigeon we all know and don’t often love, known by some as the Rock Dove, was brought over by European settlers in the early sixteen hundreds. 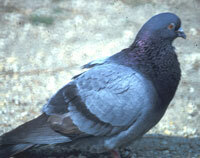 Escaped or released pigeons established themselves in settlements and towns around humans because of the abundant food supply. They can now be found in most areas of North America, and throughout the world, except in the forests and mountains. Pigeons feed primarily on seed, grain, garbage, greens and insects. Pigeons can be a real problem at bird feeders, consuming major amounts of food you have left out for the song birds. These birds feed on the ground or on platform feeders. They will not land on the small perches of tube feeders, but they may sit in the tray beneath a tube feeder! Pigeons can decide to settle in on your roof and its droppings become unsightly. In many areas, the pigeon numbers can increase to the point where its droppings create a nuisance and potential health-hazard. At this point some kind of control is often desired. 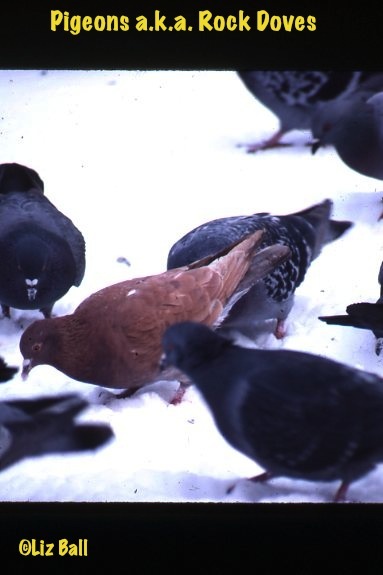 Pigeon problems tend to be a community issue rather than single property owner problems. Best results are obtained when neighborhoods and communities work together to keep pigeon populations at a manageable number. So for sure it is a mistaken kindness to feed pigeons, no matter how many romantic scenes in movies have included feeding the pigeons. Products for controlling pigeons can be found in our Yardener's Tool Shed in bird control products.